Tremendous bottom end and midrange torque on 200cc piston ported machines. 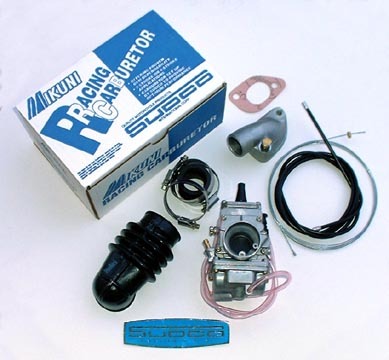 Kit comes with everything you need, including a genuine Mikuni carb (not a cheap knockoff), GP air hose to connect to your stock Italian or Indian air box, MB Developments intake manifold, hardware, extra long throttle cable and spare jets. To attach your stock choke cable, also order choke conversion kit #492.A. Note that Italian cylinder shrouds will need to have the scoop trimmed to clear the carb.